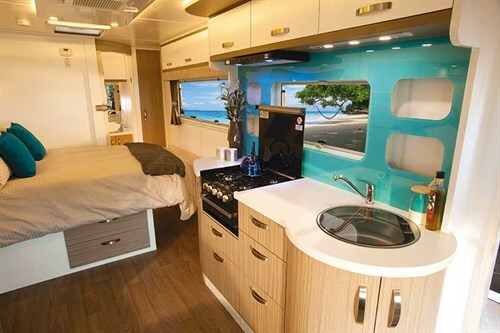 Motorhomes Caravans & Destinations editor Peta Stavelli finds herself bewitched by the Sunliner Switch S504 motorhome. The Switch 504 is no small motorhome. 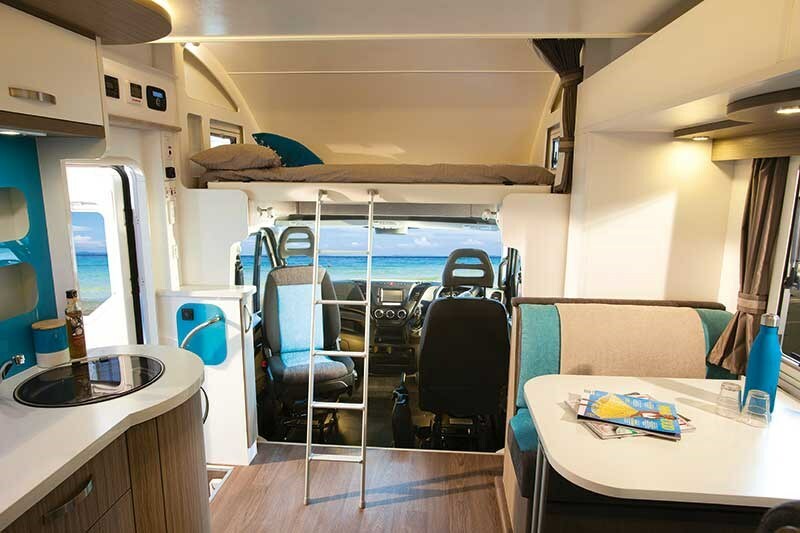 And it comes with a large slide-out, offering maximum space in an already open, light and bright home on the road, which the Australian brand Sunliner excels in producing. But for me, the most intriguing thing about the Sunliner Switch is the layout of your choice on a Fiat or IVECO chassis. The Ducato is front-wheel drive with good traction control, differential lock and it comes with a hill start button as well as a button for driving over rolling hills; a powerful three-litre turbo diesel engine; and is built for long, meandering journeys, with excellent ergonomics and standard swivel seats. It only requires an oil change every 24,000 kilometres and a service after 48,000 kilometres, or every 12 months. To ensure your peace of mind, it’s covered by a three-year/200,000km warranty. The IVECO Daily is rear-wheel drive with dual rear wheels. It comes with eight-speed full automatic transmission, on a light commercial vehicle from the IVECO trucks line-up. The Daily drives like a car, but has the strength you can get from a solid steel truck chassis. It is robust, reliable, flexible, comfortable, safe and environmentally-friendly. The Switch series is regarded as Sunliner’s entry level range. 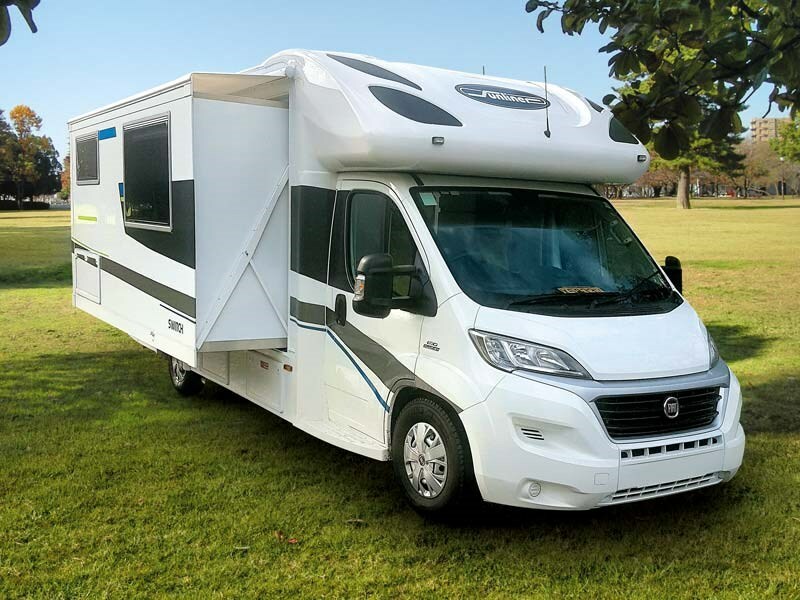 It combines the most popular elements of the ranges in a well-equipped motorhome that manages to be affordable without being basic. There are nine layouts in the range; all are over seven metres in length, 3.3 metres tall, with between 2.4 and 2.5 metres of width without the slide-outs deployed. 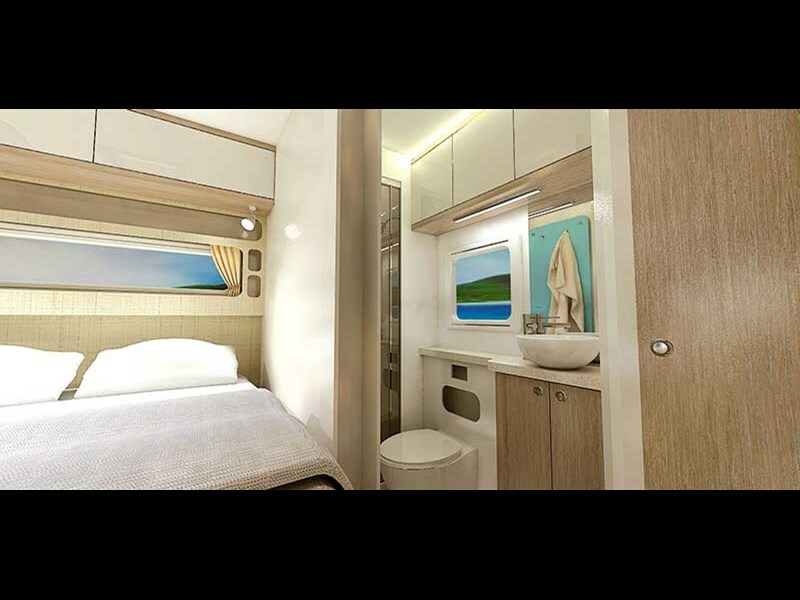 In the test model, the S504, (7.6 metres) the lounge slides out along with the east/west bed. 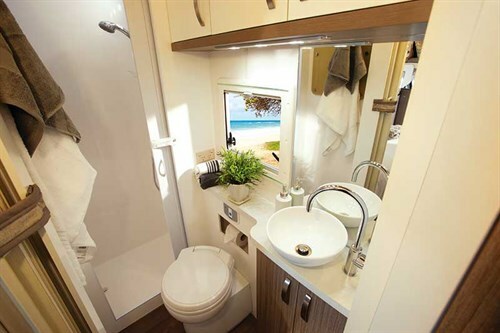 This model also offers a spacious, dry rear bathroom with separate shower ceramic toilet, vanity and mirror. It feels luxurious. On a damp winter’s day in July, we took the Switch 504 for a drive through the rolling countryside of South Auckland. This gave us an opportunity to deploy the rolling hills’ button which comes as standard in the Fiat. It romped along and I tried both the uber-comfortable passenger seat and one of the forward-facing rear seats which – in this model – comes with two extra seatbelts. The S504 sleeps four, but depending on the model you choose, the Switch can sleep from two to six. Up front, behind the swivel captain’s seats, the galley comprises a two-door fridge/freezer with overhead microwave. Adjacent is the exit and the other side is a preparation bench with stove and sink. Opposite is the slide-out lounge with ultra-comfy sofa. 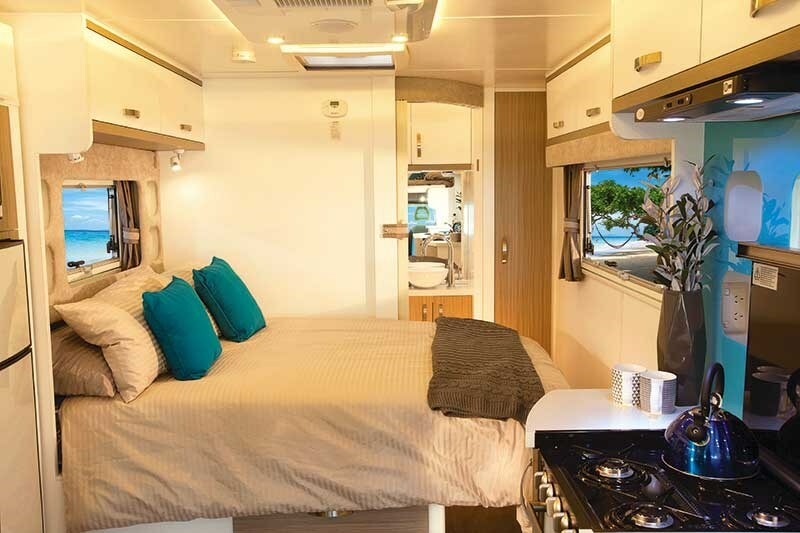 In this model, floor-to-ceiling double wardrobes offer masses of storage which, together with the low peak, means that there’s a place for everything you would need on the road – even without the external lockers. If you chose to sacrifice the wardrobes and decided to have more bench space, that is also possible. 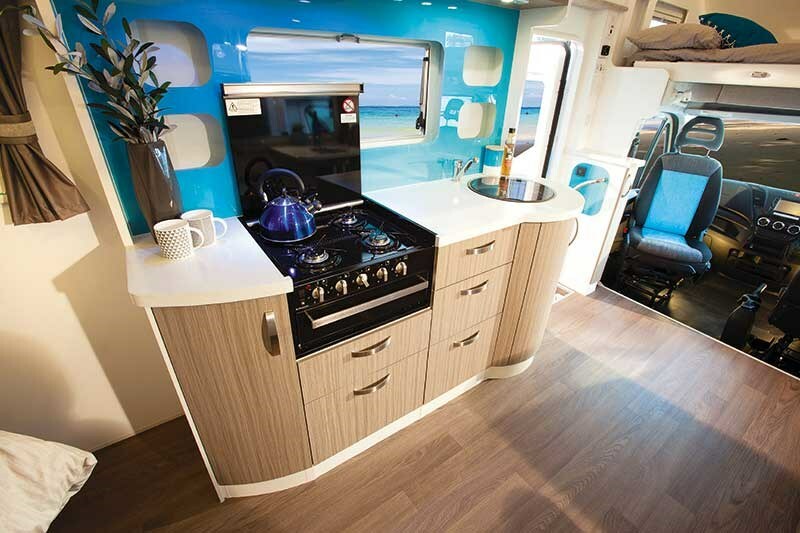 Otherwise the galley is compact and functional, with the aforementioned technology tower, a four-burner stove top with grill cooker, and a round sink, which also comes with a cover. I thought the cafe-style seating was functional and the seats exceptionally comfortable. Standard inclusions are two 100amp house batteries, which together with a 140-watt solar panel and regulator, 24-amp, 240-volt charger and two 4.5-litre gas bottles comprises the energy package. Water capacity is 155 litres each of grey and fresh. All add up to a great getaway package and I imagined the roll-out awning, which takes up most of the passenger side of the vehicle, would be well-used for entertainment. The Sunliner Switch S504 is a stylish, sturdy workhorse with understated design principles and excellent (rattle-free) construction. It would be an ideal vehicle for a family small or large or a wonderful getaway with the occasional grandchild along for the ride. 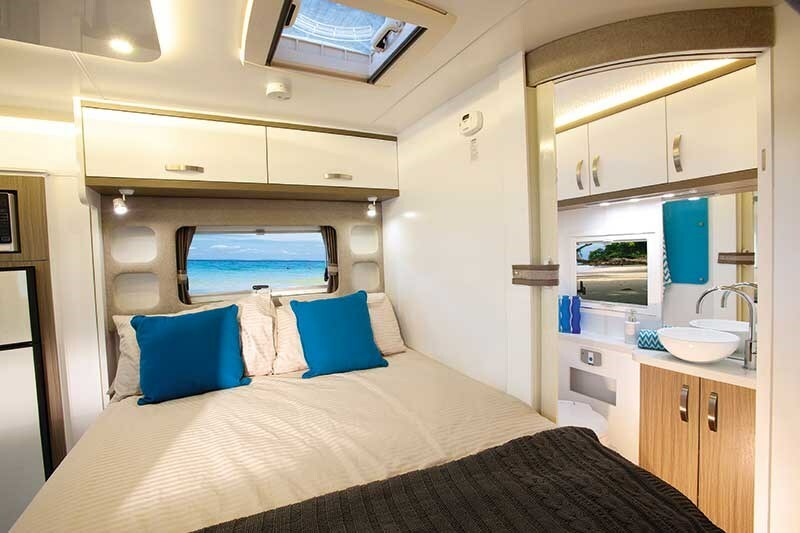 For more information, phone Auckland Motorhomes on (09) 294 6500.